In this chapter we study quadrics but unlike the previous chapter considering equivalent two quadrics when there is a Euclidean motion that takes one onto the other. From this point of view there are infinitely many quadrics (conics) in the plane, since ellipses, parabolas or hyperbolas of different size are respectively different to each other. Nevertheless, we give the classification in dimensions two and three and find lists of real numbers which represent them. For instance, in the plane, there are as many ellipses as pairs (a,b) of real numbers, with 0<a≤b and as many hyperbolas as pairs (a,b) of real numbers, with 0<a, 0<b. 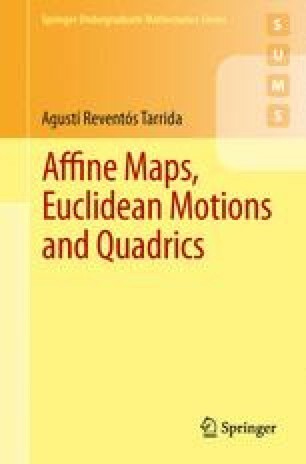 We give a faithful list of all quadrics in arbitrary dimensions. For this we shall need to introduce an adequate definition of good order among various real numbers. Most textbooks are not concerned with the faithfulness of this list: that is, that each quadric appears in the list once and only once; for this reason this concept of good order is, as far as we know, new in this context.